For the last few years, I've noticed that I seem to have developed a form of ADD. This was always the most apparent during the first few weeks of summer vacation when I would start and stop projects with lightning speed, when I couldn't sit still to read a book or watch a movie all the way through, when I couldn't clean my house all in one day, when I couldn't keep my mind on just one train of thought. As someone who had always lived for structure, who craved the routine and the predictable, who always finished one task completely and thoroughly before moving on to another, this was quite alarming to me. I blamed teaching. My mind had adapted to the need to deliver content, monitor student behavior, answer questions, pass out papers, remind everyone for the umpteenth time that classwork is to be turned in to the orange basket, run the PowerPoint, avoid saying anything that might get me fired (“do not tell little Johnny that there is such a thing as a stupid question and he just asked it”)--and the need to do so all at once. Turns out there may be something to my theory. And it turns out that this manner of thinking, the need to hyper-multitask, may be exacerbated by the rise of technology as a conduit to information. It’s comforting to know that, if I’m mentally deteriorating, it’s not entirely my fault. 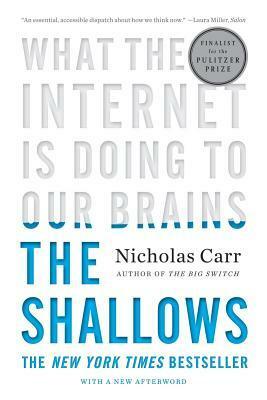 In The Shallows, Nicholas Carr questions the impact technology has upon our lives. What’s most important here is that Carr is in no way advocating a return to the pre-technology era. He admits that much good has been done and will be done by technology, and he fesses up to loving and relying on technology himself. However, he examines the idea of neuroplasticity—the idea that the brain rewires itself to adapt to the stimuli it encounters. During the age of the book, the brain had to rewire itself to be able to focus for long periods of time upon text and to think about that text deeply. This didn’t happen all at once, but was accelerated as books became more readily available to a more widely educated public. The mind became accustomed to taking in information intensely, if not rapidly, as the brain had time to ruminate on and process the information it encountered. The result was a deep thinking, literate individual. People became experts in specific areas and the keepers of knowledge associated with their particular field of specialty. They were responsible for filtering, critiquing, and judging the quality of new knowledge which had to be “vetted” before it could be accepted as accurate and true. So what have we sacrificed in this age of point and click? We’re losing the idea of specialization, which is one of the more frightening aspects to me. Any idiot with access to a keyboard and an Internet connection can post anything he wants online and it’s accepted as truth by the great majority. A society that becomes accustomed to finding any and all information online may never learn anything deeply (and what will happen when Skynet becomes self-aware, takes over, and the machines rise against us?) Instead, people will have little pockets of knowledge supplemented by what they can find online. Also, I have to wonder how many innovations and ideas were serendipitously created when answers weren’t easy to find. When an answer can be found through a quick web search, the deep thinking that may lead to phenomenal breakthroughs and intense creativity may be forfeited. In addition, our attention spans are suffering. We bounce from hyperlink to hyperlink, chasing new pieces of information which we scan quickly and, because we read over it so rapidly, it’s never stored in our long-term memory. The next time we need that information we’ll have to log back on and find it again instead of relying on our ability to recall it. Carr’s book is not the ramblings of an ill-informed radical. This book is well-researched and Carr traces how the human brain has evolved throughout history, including pre-technology, to show that neuroplasticity has allowed us to adapt to our ever-changing environments. There’s hard science here as well. If you don’t agree with Carr’s thesis by the end, there’s no denying that he's done his homework. I love technology and I think Nicholas Carr does, too. Carr’s book is not an indictment of technology, but rather a call for the public to be cognizant of the ways in which technology is affecting us—both the good and the bad. Our society has so quickly and readily embraced technology that we haven’t thought about the potential long-term tradeoffs. When we think about it and realize, “Hey, wait a minute. This food I’ve planted on Farmville—I can’t eat one damn bit of it,” then we might become more responsible about how and when we use technology (and maybe we’ll go plant a garden in the backyard). I know that I, for one, have started logging off more frequently and making sure that the time I do spend online is enriching my life in some way.